"Indian River to Battalion Chief David Dangerfield"
"Indian River to All Units"
"Battalion Chief David Dangerfield, your assignment is complete. You are cleared to go home. Indian River's clear at 12:45." So ended the final farewell to Indian River County Fire Rescue Battalion Chief David Dangerfield at Saturday's celebration of life at Community Church in Vero Beach, where more than 1,000 people gathered to share stories and remember him. 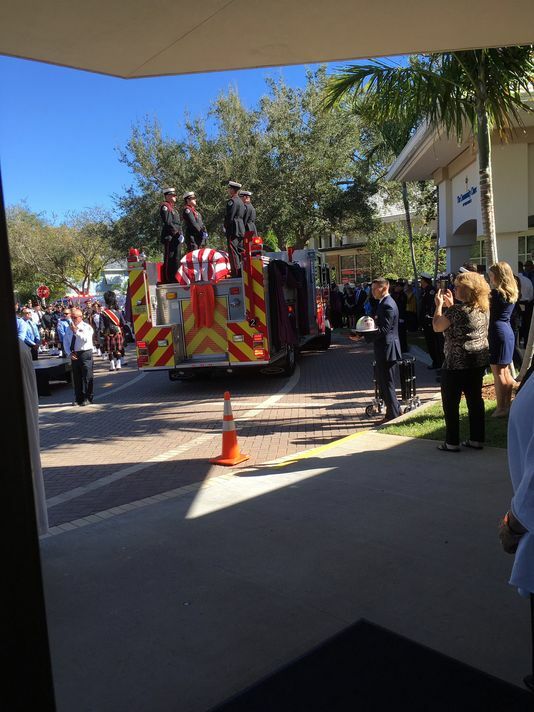 The body of David Dangerfield arrives at Community Church in Vero Beach on Saturday.